Happy New Year! 2017 is going to be a great year with some amazing new projects and tons of FREE crochet patterns like this one that will be available right here on my blog! I will also be collaborating with Yarnspirations this year and you will find several of my patterns on their site (also free!) throughout the year so be sure to follow along! My first pattern of the year is this cute little Polar Bear Cub Crochet C2C Blanket! 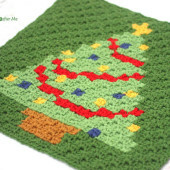 Measuring 32×32 inches it is the perfect size baby blanket and a fun winter-themed project. Like most crochet blankets, you can always make them bigger by continuing to add to the border! 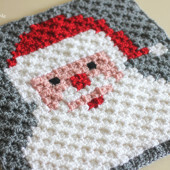 You could also make multiple C2C squares and stitch them together like I did with my Christmas Character Afghan. – Bernat Super Value Yarn in Clay, Winter White, Baby Pink, Black and Aqua. See all the colors at Yarnspirations.com! First you will want to download the Polar Bear Cub Pixel Graph. You can do that HERE. When you are done, it will be reversible! The same image will appear on either side. If you aren’t familiar with the C2C technique, I have a video class available HERE for purchase that teaches you this technique! 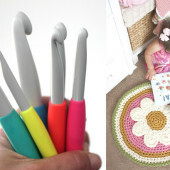 The Crochet Crowd also has a very helpful video tutorial for FREE that shows you the basic technique of corner-to-corner crochet. Check that out HERE. As you can see, you will have some ends to weave in, but overall this is a fairly quick project! See how I weave in my ends in C2C projects HERE. You can find a bigger Polar Bear C2C Blanket that I designed in Issue 50 of Simply Crochet Magazine! You can purchase and download it HERE. How many skeins of each colour should be purchased for the project? What is the yardage (or skein count) on this project? It is adorable. How can a take a larger graph pattern and size it down to a smaller blanket.? and have and animal on it also. 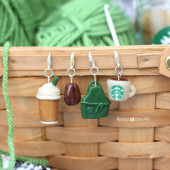 Hi, I dont see the link to download the pattern. Can I print off this pattern? I’va made a blanket with it. How many skeins of each colour did you use?